Life is full with little children. Full with laughter and love AND a lot of dishes. Although we want to feed our children nourishing foods, the relentless natures of young family life and the childcare workplace, saps our inspiration and time in the kitchen. But healthy eating does not need to be fancy. It doesn’t need to be complicated either. Little People Menu is here to create simple seasonal and nourishing recipes for the family or a group of children at childcare. We want to inspire and educate you on how to make simple and better choices when it comes to the menu and meals for the children in your care. We want to provide a practical resource to nurture the love of food in children, at home and at school. And now, we have two separate resources for you to choose from to take the stress and guesswork out of the kitchen. Created to inspire and empower educators and childcare cooks to make the best choices in nutrition for their menus and extend their food education program. The menus are aligned with the Get up and Grow Guidelines. 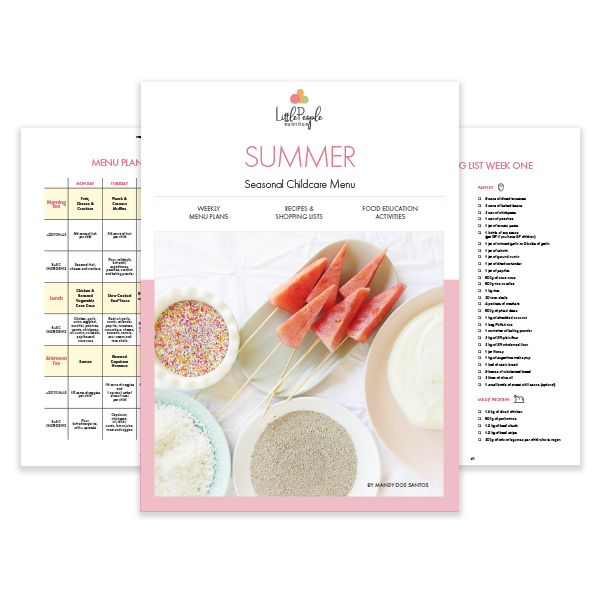 This resource is designed to give families a simple and easy menu to follow for not only the children but the whole family. Eating home cooked food not only benefits your health nutritionally but alsofor the home family, emotionally. 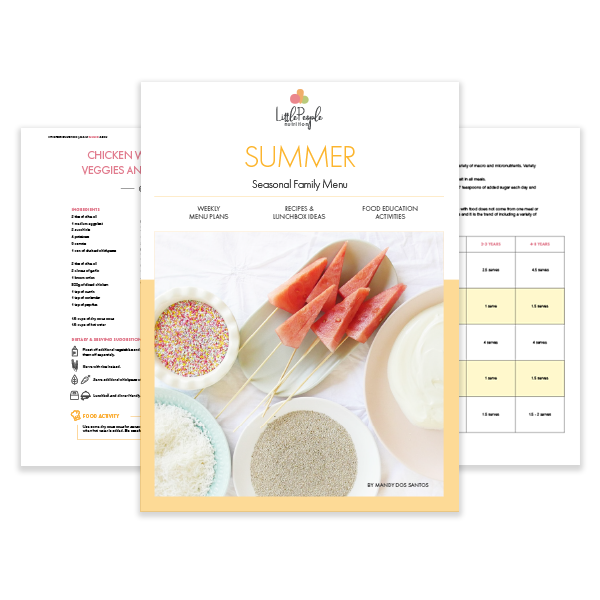 This is not just a recipe book!It is a menu plan / recipe guide / awesomely delicious downloadable e-book.We want you to feel relaxed in the kitchen and at the table. This is not just a recipe book!It is a menu plan / recipe guide / awesomely delicious download.We want you to feel relaxed in the kitchen and at the table. 4 weeks of seasonal menus with morning tea, lunch and afternoon tea. Full recipes are based on either 20 child serves or a family of four x 2. Suggested servings for different age groups. A separate Facebook group to discuss the menus with like minded families and educators. Suggested puree ideas for babies who are being introduced to solids. 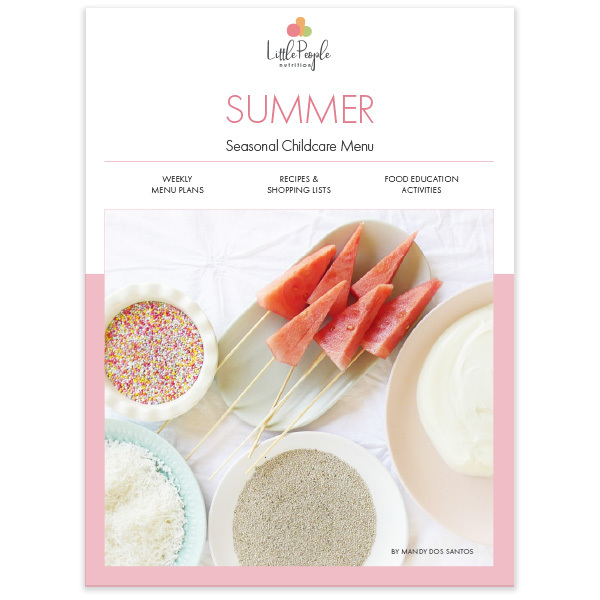 Cooking and food play activities which work alongside the menu. Recipes and menus designed around whole foods, the Australian Dietary Guidelines and “Get up and Grow” guidelines. Suggested videos to assist in understanding food, eating and cooking the menu and how best to serve it.